14 x 8 Shoemaker Brown Baseboard Return Discounts Apply ! Purchase these attractive brown baseboard returns to replace your existing aged baseboard covers. The attractive brown (driftwood tan) durable finish looks great with wood baseboard trim. Each baseboard return is made of all steel and have 1/2" spaced fins for optimal air return. Matching 2" baseboard Phillips screws in matching finish are included with each replacement baseboard cover. 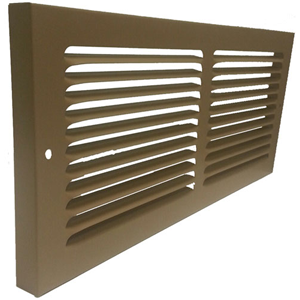 Install this baseboard return grille with louvers up or down position for best duct concealment. The Shoemaker brown baseboard returns have a 7/8" projection from the wall. ***Hint: The industry standard is to order using the actual duct/wall hole size and not the existing return cover size. This baseboard return will fit a 14 x 8 inch hole opening. Brown Baseboard Return Faceplate Dimensions (LxH): 15 1/2 x 9 1/4 inches. This brown rectangular baseboard return matches the Shoemaker classic brown triangular baseboard registers offered on our site, which means you can match your returns and registers. Purchase these attractive brown replacement baseboard covers today!